Isn’t the weedy Hellebore bed with wire fencing just super classy? It’s my patented “Postmodern Retro Tacky” design aesthetic. No, those aren’t dirty tennis balls. Those are just a few dozen of the THOUSANDS of black walnuts that rain down on my backyard at this time of year. I love working outside in the early fall, which is why it’s such a shame that I actually have to risk life and limb every time I go out there. If I manage to avoid spraining my ankle on the fallen walnuts, I am just as likely get knocked out cold by one of the nuts as it plummets to the ground. From the ground, you can hear the squeak-crunch of squirrels’ teeth scraping away the walnut hulls waaaay up in the trees. The squirrels also enjoy a flat surface on which to dine. As you can see, they do not clean up after themselves. Plenty of nuts up there left to fall. Isn’t she a beauty though? There ARE some fruiting plants that won’t put you in the hospital. Behold my Callicarpa americana. 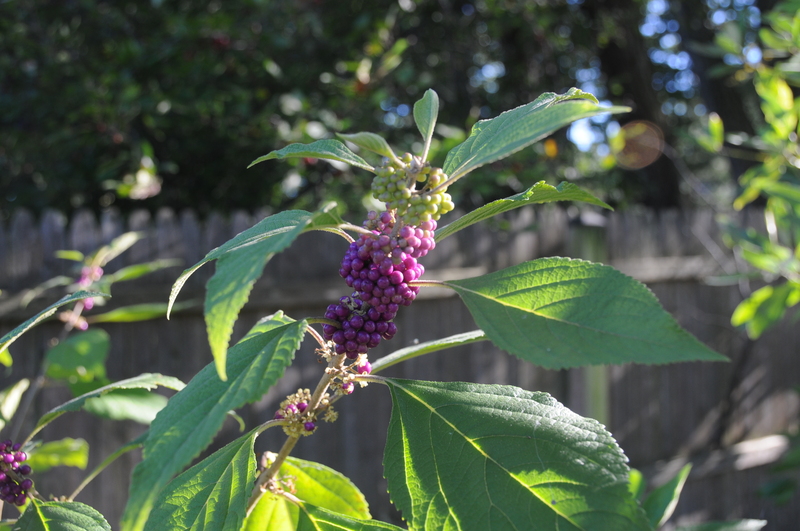 This entry was posted in plants, trees and tagged black walnut trees, callicarpa americana by Mary Gray. Bookmark the permalink. Perhaps it was a black walnut that fell on Isaac Newton’s head. Then he discovered gravity. Then more and more walnuts fell on his head, so he cut down the black walnut and put in an apple tree. Though I’m not sure how an apple tree would fare in soil that’s been poisoned with Juglone. Ha! 🙂 Actually Malus are supposed to enjoy the company of black walnuts, though my crabapple is starting to dislike all the shade its getting. Just wait until your son discovers them. The stain on flesh is indelible. I’m sure your lawnmower has already encountered one nestled in the grass. I haven’t taken a window out yet, but it’s been a near thing. Oh I know! the stains stay on your skin until your skin cells wear off. 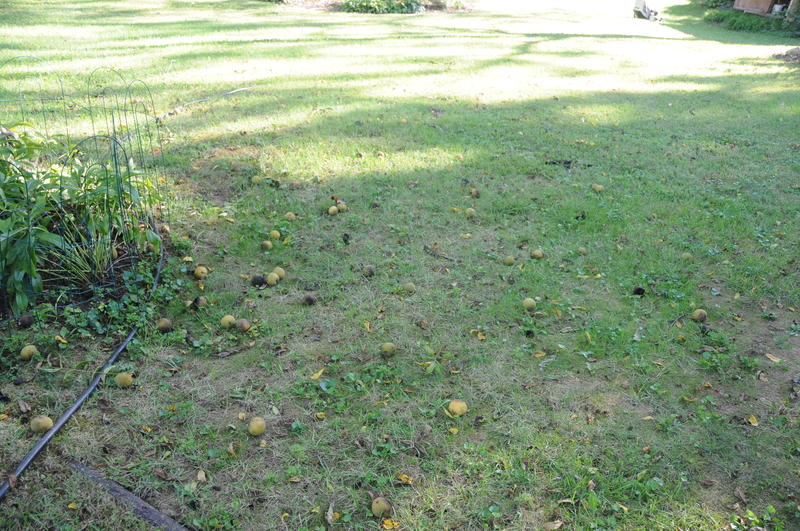 And yes, it’s quite a spectacle to see the havoc wreaked on the walnuts by my mower, and vice versa. Luckily, the house is pretty far away from the nuts. Luckily the bws surrounding me are in neighbors’ yards, but I feel your pain. Stepping or rolling over one on a bike can cause a wipe-out. A fierce wind or a bounce can send them my way. 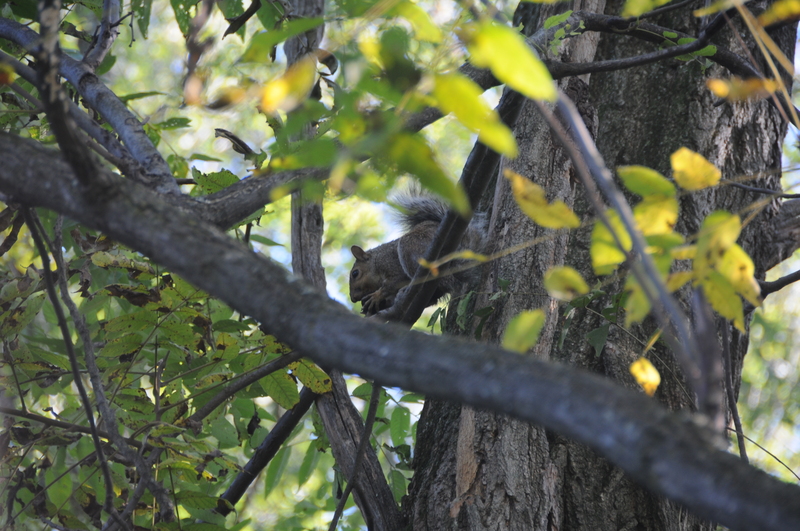 I think the scratching of the squirrels is the worst part–they perch on my fence outside my window and eat them, leaving the hulls to stain where they fall. Or worse, they plant them throughout my garden, scratching up seedlings or forgetting about the nuts–then I have to dig them out next spring when they sprout. I just wish I was not far too lazy to take on the onerous task of eating them. Yup, the stains are an eye-sore, but at least they’re not permanent. I’ve found the seedlings are very difficult to pull out, too, if you let them get a foothold. They must have a long tap root. Oh how I loathe you black walnut tree! At my last house, we had a mini tornado and it finally took out the black walnut tree in my yard – hurray! Then I bought a new house and, of course, the biggest tree on the property is a black walnut!! As much as it pains me to cut down a big, old tree, I’m saving my money to have it removed. I’m tired of twisting my ankles on the pods and having all my plants die. Kara, did you read some of the other comments here, about the value of the wood? Don’t let your tree guys grind it into chips! You need a hardhat, or bicycle, or batting helmet for this time of year. Get artsy and paint it to look like a walnut! And if it ever becomes storm-damaged, unproductive, or you just tire of it, have it removed and cut into slab flitches (a sawyer’s term) across the crotch (also a sawyer’s term). Send me two slabs, I will keep one and make you a piece of Nakashima-style natural edge furniture with the other and send it back. I’ll pay the freight. DON’T let anyone salvage out your (or any of your readers, either) black walnut tree without getting the lumber back…there is big money in it. Just search eBay for “black walnut slab.” There’s plenty of folk out there–like me–who pay well for the stuff. Ooooh, you have a deal, Calvin! Can you make something cool out of the nuts, too, if I ship them out there? Oh, and I’ll be getting to work on my walnut shaped helmet right away! Believe it or not, I have actually been thinking about this. Unfortunately, my brain keeps getting stuck on those kukui nut leis at the ABC stores in Hawaii, ammunition for a tiny trebuchet, and the obos sculpture/constructions of George Tsutukawa. I wonder, if one was to steep the nuts in water, if the resulting acidic solution could be poured down my mountain beaver holes to drive them from my clearing? 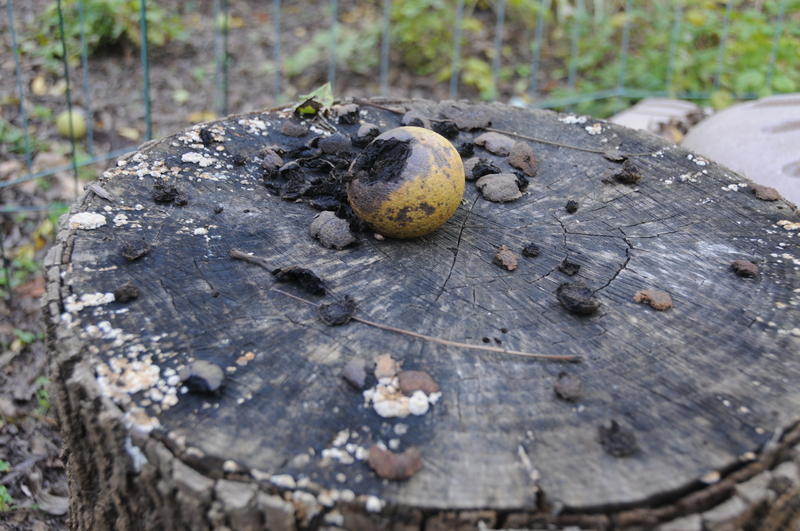 I have read that black walnut ‘water’ is the best way to collect nightcrawlers…hmmm. While I don’t have a Black Walnut anywhere in my yard, the tree seedlings come up in the oddest places (squirrels must be very forgetful creatures). The bane of my gardening existence at this time of year is a Cornus kousa, which the previous owners decided to plant 3 feet away from the house in a part of he backyard we traverse constantly. Instead of being bonked by nuts, we are in danger of being sploshed by ripening fruit! Then there’s the fallen fruit on the ground, which ferments almost instantly, attracting wasps, who are kind of cranky at this time of year anyway, getting all tipsy and swarming one as one goes about their business. Don’t let anyone tell you that C. kousa is a “wildlife tree” – wasps, flies and dogs (not birds) are the only creatures I’ve ever seen dine on the fruit! Oh dear. I think kousas are beautiful trees, the placement of yours is very unfortunate. My parents have one in their yard that is just starting to fruit. I have to say the fruits are pretty fun to squish between your fingers, but yeah, a real mess dropping on a patio! Squirrels love them, too. They leave the peels on my deck. My grandfather used to make money in fall as a kid picking walnuts. He said his hands were stained for weeks after. Those nuts are sure hard! I remember discovering them in college and thinking people were crazy for not taking advantage of them. When I couldn’t even crack one with a hammer I got a clue. Then I noticed the local magpies dropped the black walnuts into the road, waited for cars to run over them, and then swooped in and snatched them. I tried running over some once, but all I got was a mess, LOL! Anne, I have done so much research into small-scale walnut harvesting, but it always looks to be a giant mess and headache. On top of that, I don’t even think bw’s taste very good, so it’s hard to find the motivation. Now, if they were pecans it would be a different story! Ugh. You have a lot of picking up to do. My husband is a woodworking artist. He has had more than one customer have him chop down one of their walnut trees and make furniture for them out of it. Right now, he is making a wooden archway for the entrance to our dining room using a tree from his step-father’s property. So fun. Thank you for another wonderful post. I love this blog! All the empathy in the world. 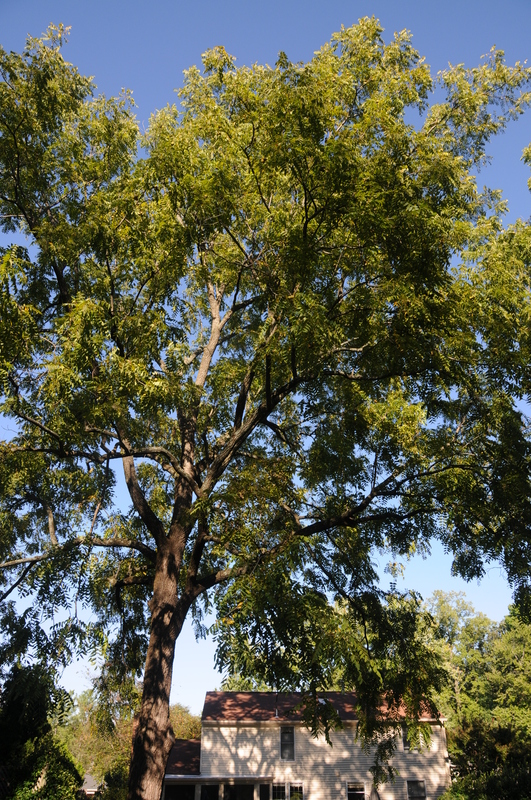 My black walnut (closest tree to the house) is about 100 feet tall, and from late August on we have irregular thumps and explosions as the nuts hit the roof, or other things (birdfeeders, deck (permanently stained), occasionally cars. We will never be able to get solar panels). I have actually only been hit by a falling nut myself once in 25 years though. On the shoulder, not the head, luckily. omg, 100 feet tall! I think mine is probably only 50 or 60. Thumps on the roof would definitely be disconcerting, and I imagine they’d clog your gutters, too! I have been hit a couple of times by the falling nuts. No concussions or anything, but if they were falling from 100 feet that might be a different story!